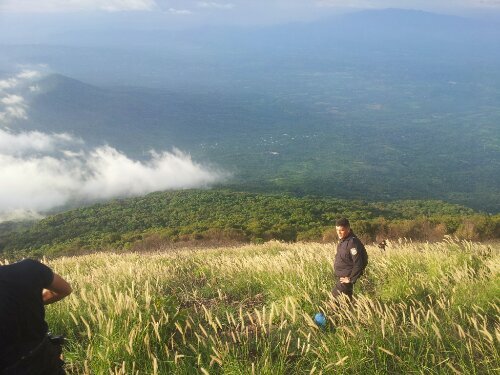 My next rendez-vous with the El Salvadorian police was in San Miguel. 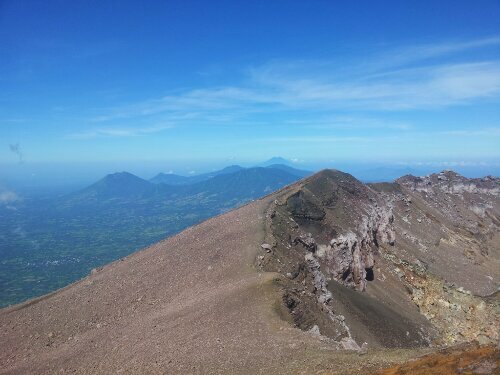 This time my plan was to climb Volcán de San Miguel and camp at the summit to ensure a full panoramic view without cloud obstruction. 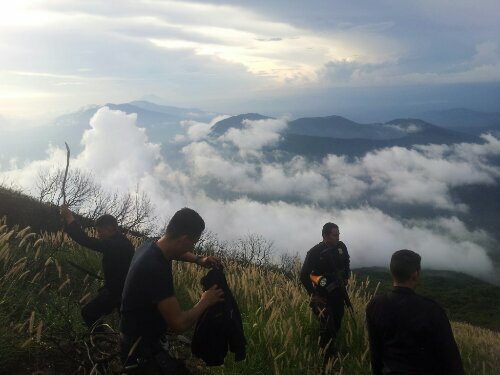 After dropping my bike at La Placita police station (that sits in the saddle between Chinameca volcán and San Miguel volcán) 6 policeman and I headed up the volcano. Amazingly we were able to drive to within an hour to an hour and a half hike of the summit on a forest trail. Five of us continued on foot and we reached the large impressive smoking crater just as it was getting dark to witness a jaw-dropping sunset and excellent views of the volcano chain to the west; this was enhanced by the huge cloud formations that unfortunately turned out to be a storm on its way. 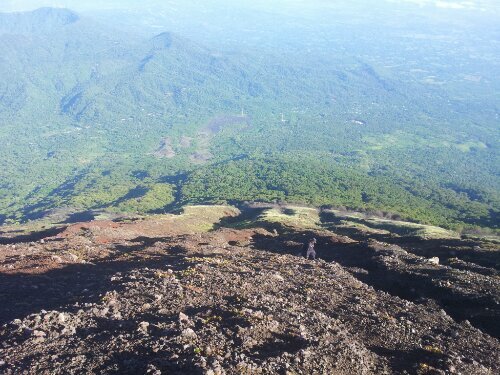 We started hiking round to the other side of the crater where there was, supposedly, a suitable camping area. After a short while, they decided to abort this idea and we headed down the steep, rocky volcano to find some flatter ground. After 100 metres they chose a spot on the steep slope that was impossible to camp on. 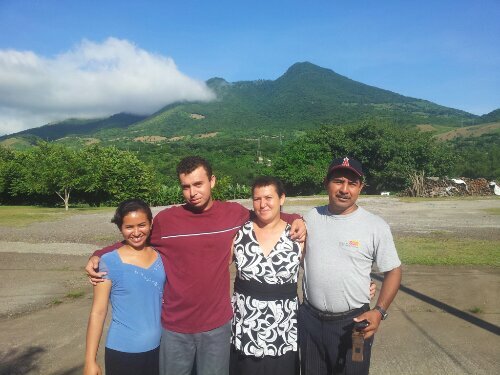 Just by Río Lempa on the way to San Miguel, this kind family runs a turicentro where I camped for the night. It was dark and they started a fire with the wood they’d collected on the way up. For a few minutes life was good; what an amazing place to be. But then the inevitable rain started, I wrapped myself in my tarp and lay down. It rained hard and after ten minutes I felt a huge shock go through my body along with an immensely bright flash and large clap of thunder. For a few seconds I was in a state of sock; the lightning must have hit the volcano and dissipated along the ground and then into my body. One of the policeman came over and shouted through the pouring rain – “bajamos!” /let’s go down! All four of them had also been in the path of the lightning. 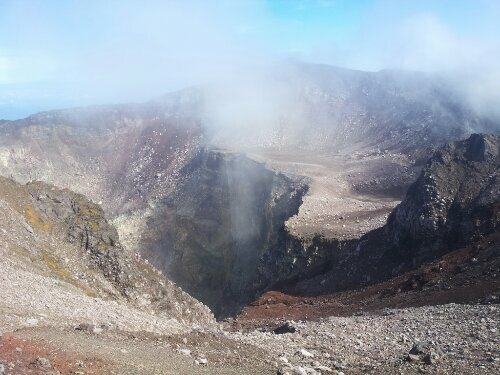 We headed down about 100 metres but quite quickly realised it was perilous to continue since they were unfamiliar with this side of the volcano; the chances of losing our way were high. Add to the this the steepness, low visibility and moderate risk of landslides during the wet season saying we weren’t in a good spot would be an understatement. 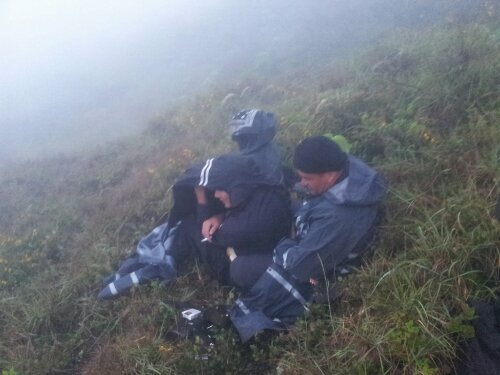 We huddled together to conserve body heat partially under my tarp whilst the rain continued for the next 5 hours. 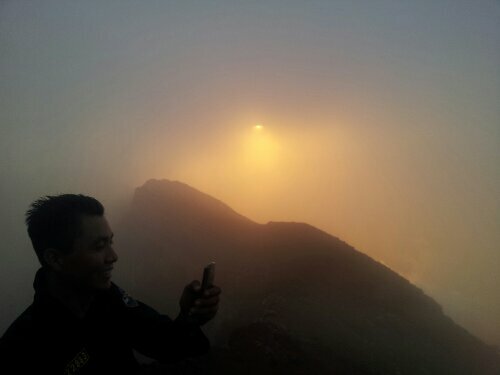 In my shorts, base layers, and feeble rain jacket at nearly 2000 metres I was in for a very cold night. The lightning storm continued closeby and the continual threat of lightning loomed over us. Time ticked by painfully slowly; two minutes felt like half an hour and I struggled to stay awake concerned that sleep could may make me susceptible to hypothermia. Then after about 1am the weather cleared and for an hour or two the views of San Miguel city and the surrounding valleys were astounding; it felt like we were in space or somewhere equally unearthly. 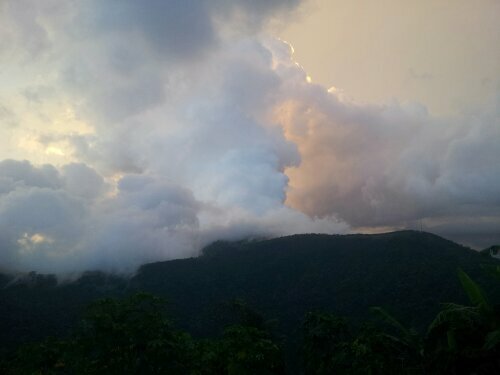 Close to 4am I spotted a large cloud marching up one of the valleys below us. 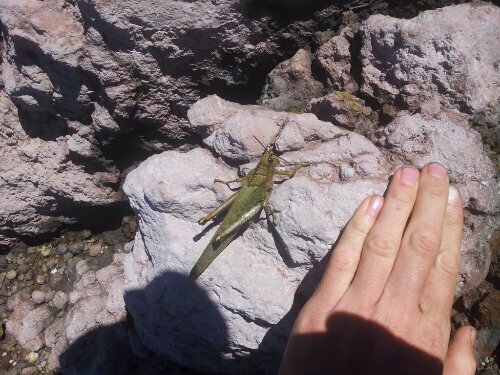 It made a sharp left and headed straight for the base of San Miguel. 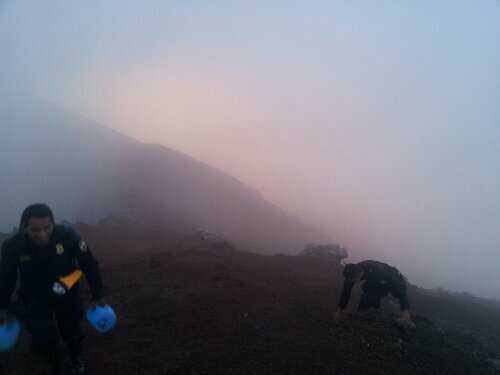 It then rose steadily towards the top of our volcano and eventually obscured our entire view of the surrounding landscape. 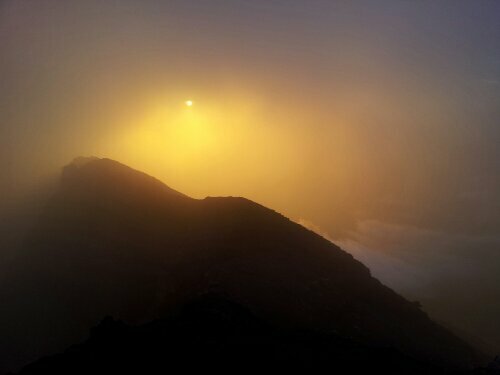 The fog remained for the next five hours and unfortunately robbed us of any chance of a consolatory sunrise view. Light eventually came at around 5.30 and we headed down after approximately zero seconds of sleep. Back down at the station a few hours later we could see the volcano; the summit had totally cleared. The chief of police suggested we climb it again the next day and I immediately snapped him up of the offer. I wanted to see the full view. 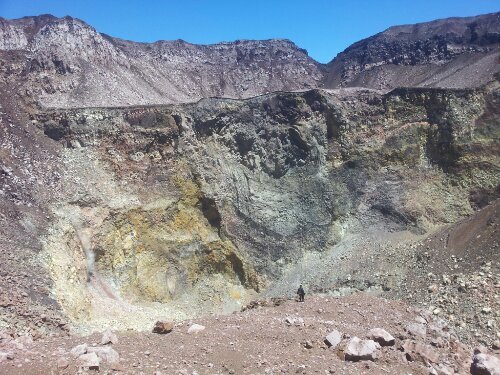 The next day was sunny and cloudless until the late afternoon; we hiked round and partially into the crater. The views were incredible. We headed down to northeast side with another group of 7 bike tourists that just happened to up there. On our way down the rain came again and I suddenly became very aware at how tedious it was to have wet bicycle shoes. November 13, 2013 in 2. 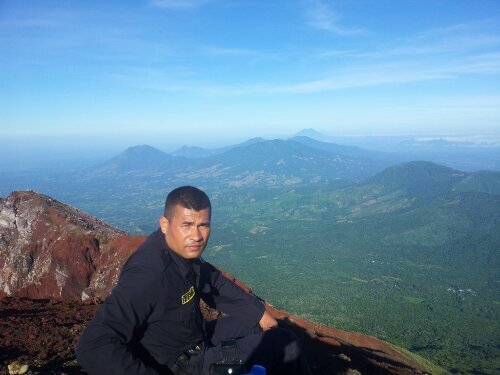 Central America, CLIMBING VOLCANOES / MOUNTAINS, El Salvador. 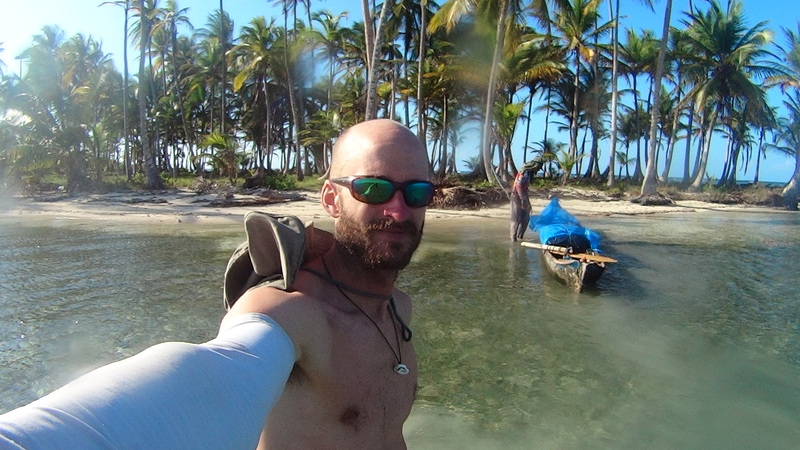 Nick, Your adventures astonish us! Word must have spread through the Salvadoran police force that you can have an exciting time escorting Snr Nicolas Gault. For Thanksgiving this year we have only 2 out of 6 of our families visiting but it’s fun anyway. We’re looking for somewhere to visit for Christmas. Any idea of where you’ll be at that time? Nicholas. You are unstoppable! 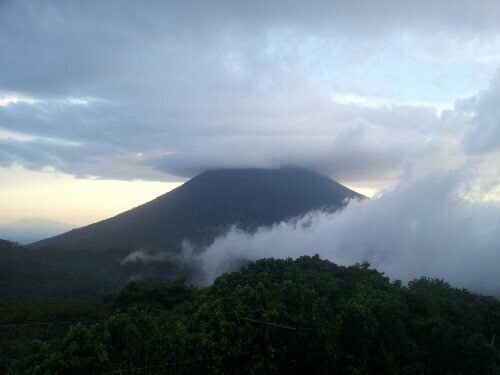 I love that you went back up the volcano the very next day! Ha ha, thanks ginger. 🙂 in Costa Rica now. Some awesome trails here… Hope you’re getting some good rides in too! hi Nick! you are amazing! was very nice to be your neighbors at reserve junquillal, guanacaste -costa rica!